It's been weeks since I've posted anything here. Things were moving ahead nicely on the velvet jacket. Maybe you remember? Unfortunately, my mom, who lives in a retirement community in New Hampshire, developed some pretty serious health problems. In response, I've been back and forth from my home in Maine almost weekly for the past month. 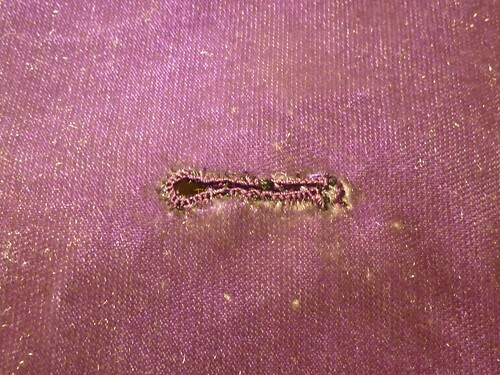 What sewing I've accomplished has been "around the edges" of a pretty chaotic lifestyle. I did manage to get it hemmed, and the lining is completely finished. It really only needs buttonholes and buttons at this point. I'm glad to report that mom's doing much better, and things are slowly returning to normal around here. Still, there's not much progress being made on the jacket. Why??? I got it into my head that I want to do handworked buttonholes. I blame the whole thing on Laura Mae and her gala extravaganza! Seriously, this woman is such an inspiration. Is there anything she doesn't have the courage to tackle? What would Laura Mae do? Heck, I've even gone out and bought 2 yards of silk organza because of her, even though I have NO idea what I'd do with it! So here's the hold up. In order to do the job properly, I've ordered a buttonhole chisel and keyhole punch. Unfortunately, they're on back order and I have no idea when to expect them. OMG, how horrible is this!!!! Needless to say, I have a lot of practicing to do. On a more positive note, I've been working on a new shirt. Maybe you've noticed, there seems to be a floral trend coming off the runways for Fall and Spring. Flowers are apparently appropriate year round. So I'm jumping on the bandwagon! Plus, what guy doesn't need a new shirt? For some reason shirts are easy to sew in little steps, so I've been working on this over the past three weeks. 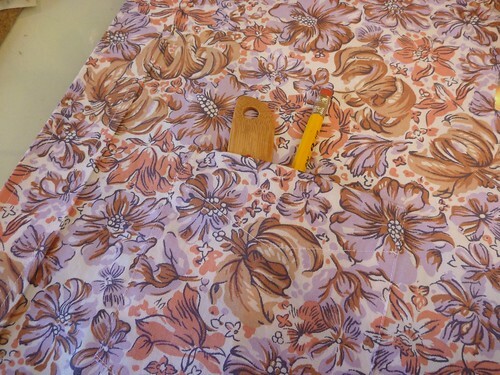 Sometimes I only have time to sit down and do one thing, say, sew a placket. Then it sits until I have time for the next one. Over time it comes together. I'm using a cotton shirting that I picked up on sale at Denver Fabrics. Total fabric investment $13.82! It's been very easy to work with, and fun to match. I used a contrasting stripe under the placket, inside the collar band and inside the cuffs. But there's much more in store for this shirt. Now I have TWO unfinished projects! I am amused at the "floral trend for fall and spring." This trend hit the Korean fashion scene last year, and by the summer, K-pop fans were complaining about it. Personally, I got tired of seeing pop groups dressed like 1950's sofas and wallpaper. For example, http://seoulbeats.com/2013/07/for-your-viewing-pleasure-attack-of-the-floral-suits/ . Love the way the shirt is turning out! Love the shirt. I like men in big florals. Now was "fun to match" meant sarcastically or was it really fun to match! 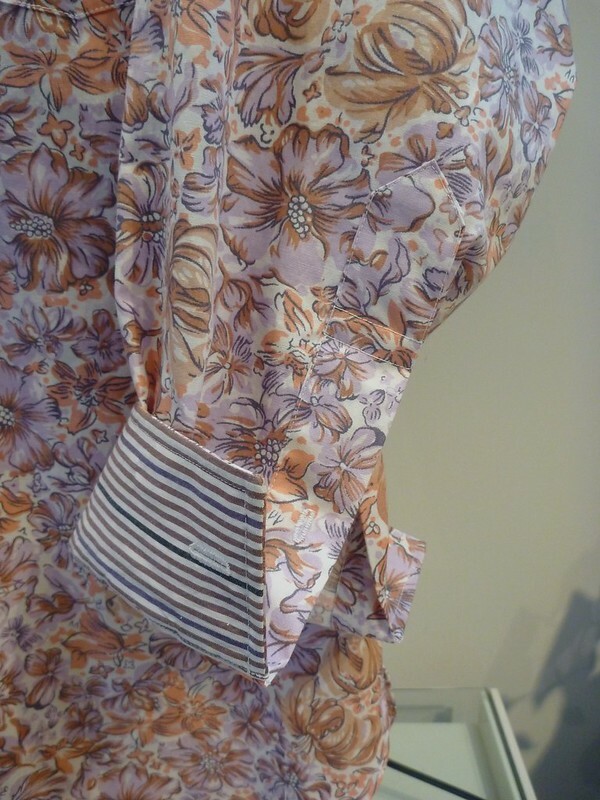 The contrasting stripes are a dead-on perfect match for the florals. Looking forward to seeing the finished shirt. That floral shirt is fabulous! I love the stripes. 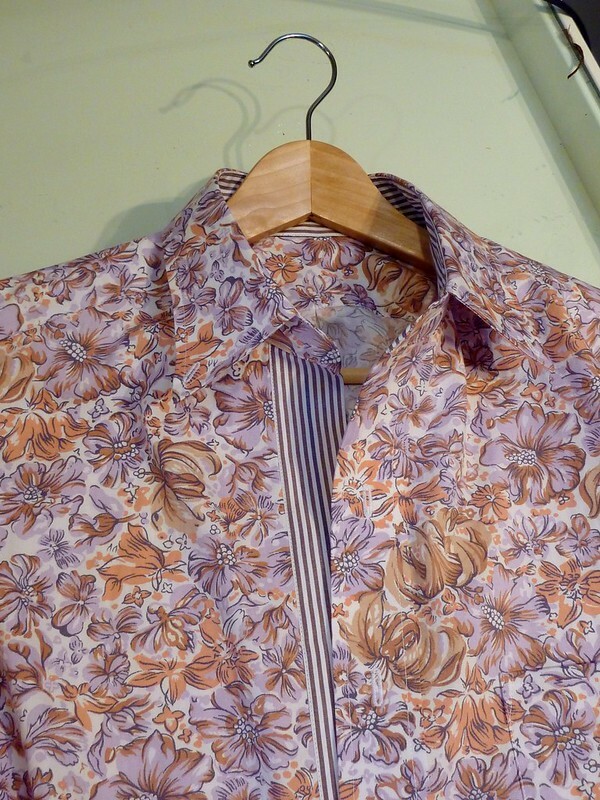 I wish I was courageous enough to make my hubby a shirt in all floral...I settled for a little floral for contrasting the stripes of the business shirt I have only recently made him for his birthday (I actually put this in my blog). But I think you might have inspired me to actually go ahead with the complete floral shirt, (and maybe I might even shamelessly copy your contrasting stripes ;-). Thanks for the inspiration!